There's a great deal of confusion about the difference between the BT Broadband Accelerator (previously known as the I-Plate) and an ADSL faceplate (also known as a filtered faceplate). In this page, we describe what each of these is, and discuss why a filtered faceplate is the better option. You do not need to use both of these devices at the same time. Both devices can significantly increase broadband speed when you have extension wiring and sockets in your home (by reducing interference to your broadband signal), and fit on to the standard BT NTE5 mastersocket. The BT Broadband Accelerator is BT's new name for the BT I-Plate. This device can significantly increase broadband speeds by isolating one of the telephone wires (knows as the ring wire) on your extension wiring, which can prevent interference being picked up on this wire. The BT Broadband Accelerator was developed by BT's Wholesale Division. BT has tested its Broadband Accelerator on 36,000 lines and claims that it increased downlink broadband speeds on average by about 1.5Mbps and, in some cases, it increased speeds by up to 4Mbps. BT also says that its Broadband Accelerator can significantly extend the reach of broadband services (by increasing signal-to-noise ratios by around 10dB). To install the BT Broadband Accelerator, simply unscrew the bottom faceplate from your BT NTE5 mastersocket and then plug in the BT Broadband Accelerator. Finally, you can screw the original faceplate back on over the top. As you do not need to make any changes to your extension wiring, installation is incredibly simple. Please note that, unlike a filtered faceplate, the BT Broadband Accelerator is not a replacement for your existing ADSL broadband filters, so you will still need to use filters on all your telephone extensions when the BT Broadband Accelerator is installed. If you already have a filtered faceplate installed (described below), then you do not need to install a BT Broadband Accelerator, since the filtered faceplate performs the same function (and more) as the BT Broadband Accelerator. While you can purchase the BT Broadband Accelerator directly from BT, you can also purchase one through Amazon at lower cost. If you wish to purchase the BT Broadband Accelerator, please consider doing so via the link on the left. This will generate a small commission to contribute towards the costs of running this broadband information site. A filtered faceplate simply replaces the existing faceplate on your BT NTE5 mastersocket. By filtering the ADSL broadband signal directly at the faceplate, there is absolutely no need for microfilters on all your extensions, unlike the BT Broadband Accelerator. An extremely elegant solution! A filtered faceplate filters out the broadband signal from all of your extension wiring, not just the ring wire (as with the BT Broadband Accelerator). This gives you the maximum possible performance as none of the wires in your extension wiring can interfere with the broadband signal. You can expect to get at least as much improvement in broadband speeds with a filtered faceplate as the BT Broadband Accelerator. Our experience shows that downlink speed improvements of 2Mbps or above are often achieved through the use of a filtered faceplate. 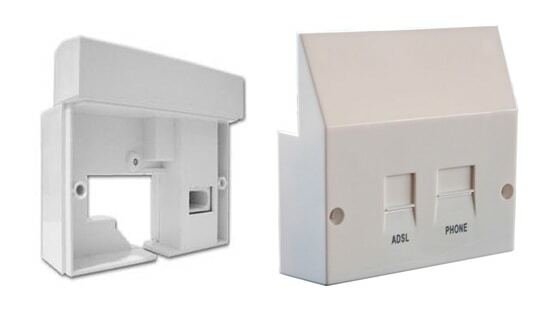 A filtered ADSL faceplate can make the difference between having a reliable broadband connection and having no connection at all on a long line from the BT exchange. Installation is straightforward. You simply unscrew the existing faceplate and replace it with the new ADSL faceplate, screwing it into place with the existing screws. If you have extension cables these will be connected to the BT faceplate so you have to remove the extension wires from the existing faceplate and connect them to the new ADSL faceplate. Clear instructions will be provided with the ADSL filter (and are widely available online for different faceplate manufacturers). Bear in mind that, once the ADSL faceplate is installed, you cannot connect your modem to an extension (since the broadband signal is no longer carried through the extension cables), and you must connect your modem to the BT mastersocket. As discussed in our Increase Broadband Speed Guide, you should never consider connecting a broadband modem to an extension socket anyway. Always connect your modem to the BT mastersocket (using a short modem cable) for optimum performance and reliability. You can purchase a high-quality filter faceplate at an excellent price through Amazon, using the link on the left. We generate a small commission from this to help fund the running costs of this broadband information site, while you get the same great Amazon price. Thank you. While an ADSL faceplate can make a dramatic impact on downlink broadband speeds, it must be remembered that it can also bring additional benefits (to deliver improved service reliability and even greater downlink speeds). A filtered faceplate will reduce the susceptibility of your broadband connection to different types of interference, which will reduce errors and make your connection less prone to dropping. We have found that reduced interference may allow you to successfully apply additional broadband speed enhancement techniques (such as SNR margin tweaking) to squeeze even more speed from your broadband connection! What speed gain will I get from an ADSL faceplate? Find your BT NTE5 mastersocket in your property. Record the downlink connection speed of your broadband service. Please read your modem manual on how to get this number. Disconnect the modem from the BT mastersocket. Unscrew the bottom faceplate and pull it out. Please note that this will temporarily disconnect any phones you have connected to extension sockets in your property while you carry out this test. Unscrewing the faceplate will reveal a 'hidden' phone socket, which is known as the 'test socket'. Plug a microfilter into the test socket, and connect your modem to the microfilter. If you see an improvement in downlink connection speed, then a filtered faceplate will help you. You can buy one easily through Amazon. Our Increase Broadband Speed Guide provides many tips to extract the very highest speed possible from your line. Your WiFi could currently be the bottleneck for your connection. With our WiFi Optimisation Guide, you can ensure that your wireless connection is not the weak link in your system.